7th and Pennsylvania Avenue, SE, circa 8:45am, Saturday December 29. Eastern Market is open today, 8:00am until 5:00pm. Eastern Market Metro Plaza – the Department of General Services begins geotechnical borings for the Eastern Market Metro Park Project on the site. New Year’s Day. DC Government is closed. Swearing in of Mayor Bowser, Council Members, Attorney General, 9:30am – 12:00noon, Walter E. Washington Convention Center, 801 Mount Vernon Place Northwest, 3rd Floor Ballroom A & B.
Swearing in of ANC Commissioners at 3:30, Walter E. Washington Convention Center, 801 Mount Vernon Place Northwest, 3rd Floor Ballroom A & B.
ANC6A Transportation & Public Space Committee meets at 7:00pm, Capitol Hill Towers, 900 G Street, NE. ANC6A Alcohol Beverage Licensing Committee meets at Sherwood Recreation Center, Corner of 10th and G Streets, NE. CHRS Board of Directors meets at 6:30pm, Townhomes, 750 6th Street SE, 2nd Floor. ANC6B Executive Committee meets at Hill Center to set the agenda for the January meeting of the ANC. Tommy Jones, Chief of External Affairs, DGS (far right), hosted the meeting on behalf of DGS and fielded questions. Project manager Cassidy Mullen outlined the timeline for the project; “Our purpose is to get a full set of drawings for federal and city approval. The Department of General Services (DGS) hosted the first community meeting on the redesign of Eastern Market Metro Park Thursday night. They came with what appeared to be a new willingness to acknowledge the work done on the ‘master plan” for the redesign, i.e., the 2015 Weinstein/Oehme van Sweeden (OvS) plan which was the product of extensive community involvement over a 2 year period. 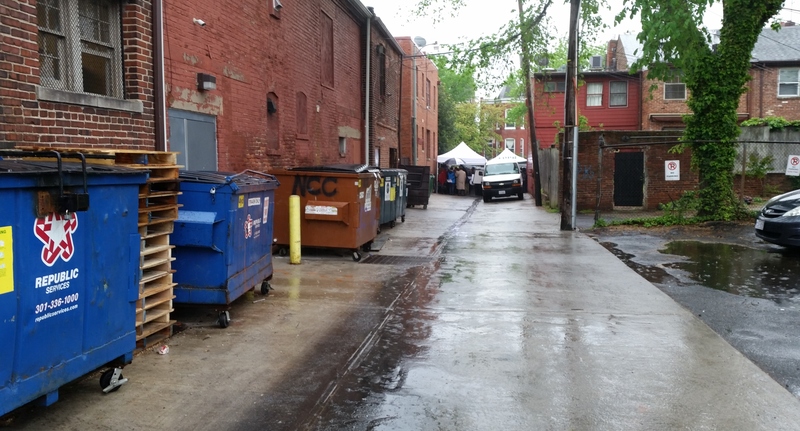 In addition, the agency admitted that their outreach had “not been the best,” particularly with respect to their communications with residents and ANC6B – as well nodding to a new appreciation of the role that the Commission plays in providing input on public projects. The tone was decidedly conciliatory, in contrast to that taken with the Eastern Market Metro Park Advisory Team in the meeting last Monday. 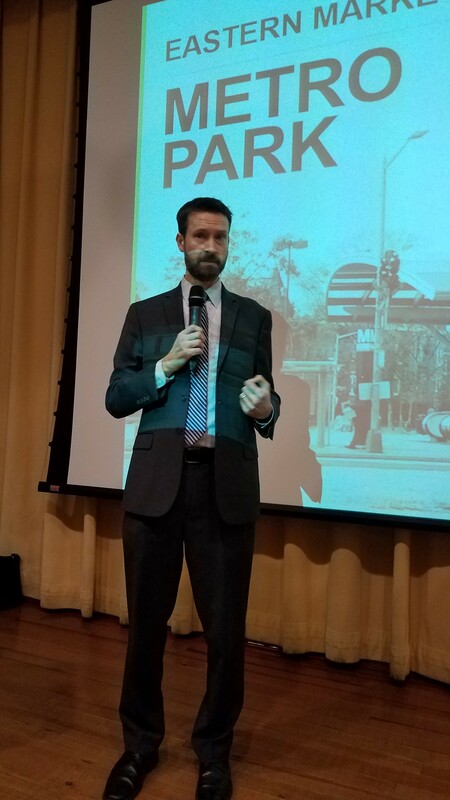 (See here: https://bit.ly/2BbQiDd) In a dramatic moment when ANC6B Commissioner-elect Steve Holtzman (whose single member district abuts the Metro Park on the north) raised a challenge to DGS regarding denial of public access to that meeting Council Member Charles Allen intervened, pushing DGS to open the meetings of the Advisory Team which here-to-for have been closed. Allen said, “I can’t think of a single reason why the meetings can’t be open. I encourage DGS to look at public meetings. Let’s do that.” An off-balance DGS promised to respond to Allen. When DGS took the stage, Project Manager Cassidy Mullen said that the winter would see back and forth on tweaking the master plan. By summer, the process would produce schematics and changes to the master plan based on feasibility. Construction will start in August or September of 2019. 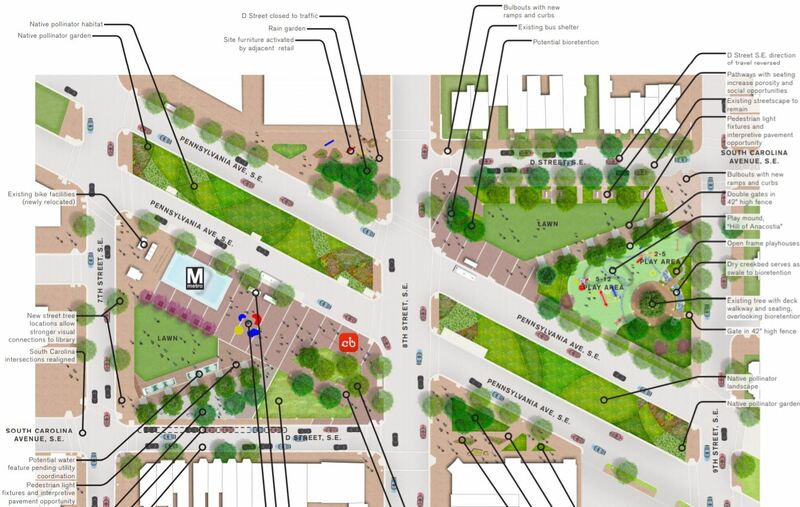 To some in the room, the phrase “based on feasibility” introduced an element of uncertainty, perhaps referring to one of the critical elements of the Weinstein/OvS plan benefiting Barracks Row, i.e., moving the bus stop in front of Starbucks to the eastern edge of the part of the plaza with the Metro entrance. 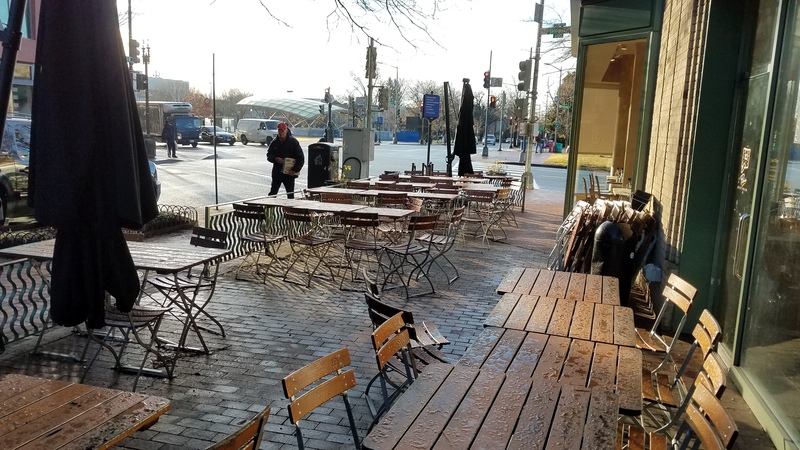 The business community sees moving the bus stop as critical to opening up access to the restaurants and retail beyond the intersection of 8th and Pennsylvania Avenue. CVS and the design team see problems involving the expense of moving utilities and infrastructure. For its part, the Moys Design team, charged with creating the final re-design plan, said its goal was to make the park “a third space in your life” after home and work place, and pledged to come back multiple times to tweak and refine the plan. Questions from the audience expressed concerns regarding playground safety issues, the bus stop move, the proposed reversal of traffic direction on D Street on the north side of the playground, ADA access, rats, parking of construction worker vehicles, table and chair amenities, public restrooms, process transparency, the wisdom of installing high maintenance lawn areas, bike lanes on Pennsylvania Avenue, and how better to use the project to connect the business corridors. Following the meeting, attendees were invited to engage agency officials and design team representatives in adjacent rooms to discuss concerns and specific portions or the plans. Attendees seemed optimistic about the process moving forward. Whether the era of good feelings continues depends in part on the participation of residents and business owners in the process, but much depends on how the community perceives whether its voice is being heard and the degree to which residents and business owners are made to feel a part of the process. 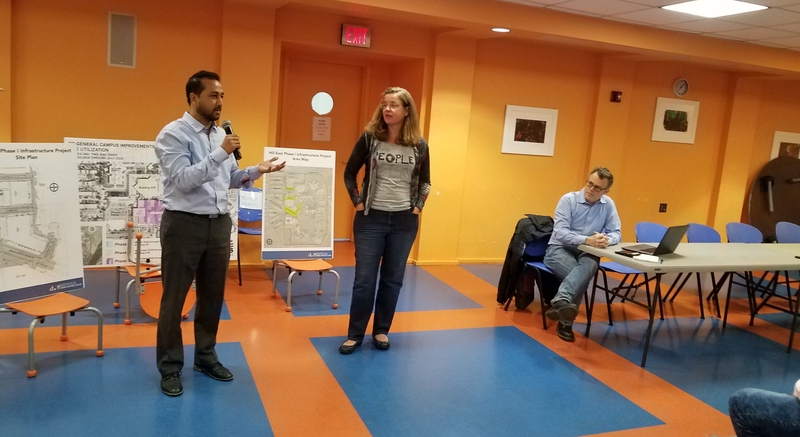 DMPED rep Ketan Gada, (left) with Hill East Task Force Chair Denise Krepp and ANC6B Chair Dan Ridge at Hill East Task Force Meeting on Monday night. 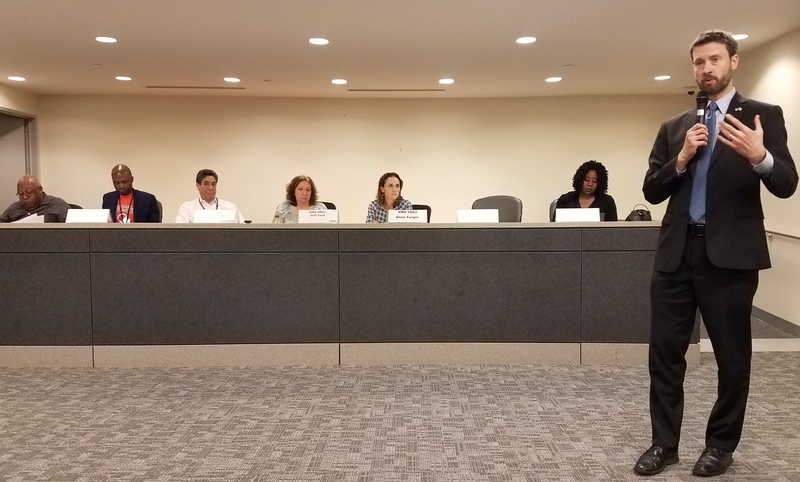 Monday night, Hill East Task Force held the latest in a series of meetings, summoning city agency officials to explain the city’s plans for the future of RFK and Reservation 13 and the Mayor’s lack of transparency thereon. It fell to DMPED representative Ketan Gada to appear before the Task Force to answer questions about the Post article, which appeared to describe the latest in a series of undisclosed plans for development of the valuable river front land, including bids for the Olympics and for Amazon’s HQ2. Gada replied, “The Mayor is not doing anything. Since DC United moved to its new stadium RFK has had very little use…it has become revenue obsolete…underutilized. The options we have are to extend the lease or to acquire the land from the National Park Service.” He envisioned a future commercial use for the site involving housing and retail as well as recreational uses. Krepp subsequently sent the email, copying multiple city officials and news agencies. The message read in part: “…a DMPED representative told Hilleast residents tonight that Mayor Bowser is not working with Dan Snyder and House Republicans to include language in the appropriations bill. This information was shared at the Hilleast Taskforce meeting and the DMPED representative was Ketan Gada, the Director for Hill East District Redevelopment. Residents repeatedly questioned Mr. Gada about the Mayor’s involvement. These questions were based on the recent Washington Post story written by Mike DeBonis and Liz Clarke. 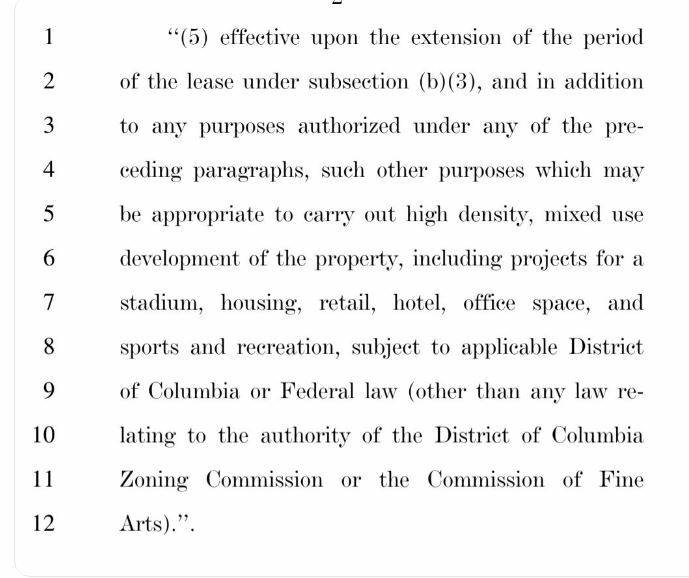 The story states that Mayor Bowser is working with Dan Snyder and House Republicans to extend DC’s lease of the RFK property and to possibly expand the use of the property to non-sports related activities. Each time he was questioned, Mr. Gada claimed lack of knowledge and denied that Mayor Bowser was speaking with Congressional representatives. ANC6B Chair Dan Ridge noted that the language proposed to be added to the Congressional spending bill had been made public that day by Martin Austermuhle, WAMU reporter (see below). Ridge said the language almost looks reasonable, but that its far from clear that Events DC is the best manager to carry out the listed potential uses of the site – Events DC doesn’t do housing – what they do is events and retail supporting events. Cassidy Mullen, DGS Eastern Market Metro Park Project Manager, welcomes the members of the community advisory team at it’s second meeting on Monday morning. Seated to his right are Advisory Team Co-chairs, Martin Smith and Madeleine Odendahl. 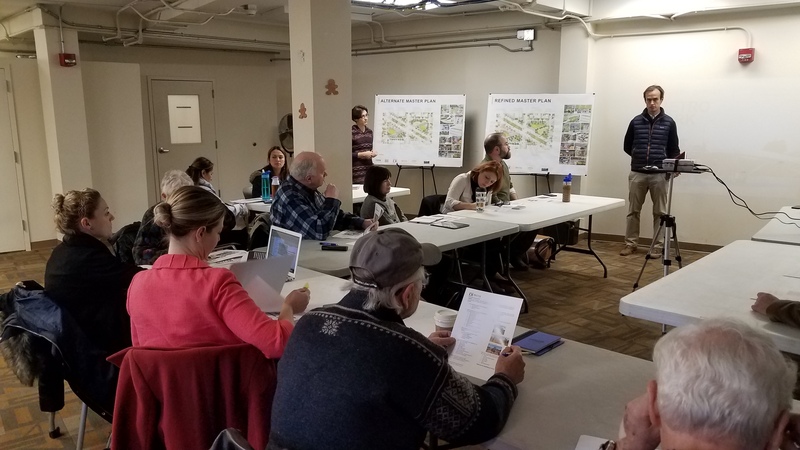 DGS and Moya Design Partners got a rude awakening on Monday morning at their meeting with community stakeholders on the redesign of Eastern Market Metro Plaza. The meeting with the Eastern Market Metro Park Advisory Team was scheduled to give the Advisory Team an advance look at and an opportunity for input on the redesign plan to be presented at the first of several community meetings at 7:00pm Thursday night at Hill Center. Smith reportedly said that the community had spent two years developing the Weinstein/OvS Plan and pointed to the failure to engage businesses and residents as a major concern. 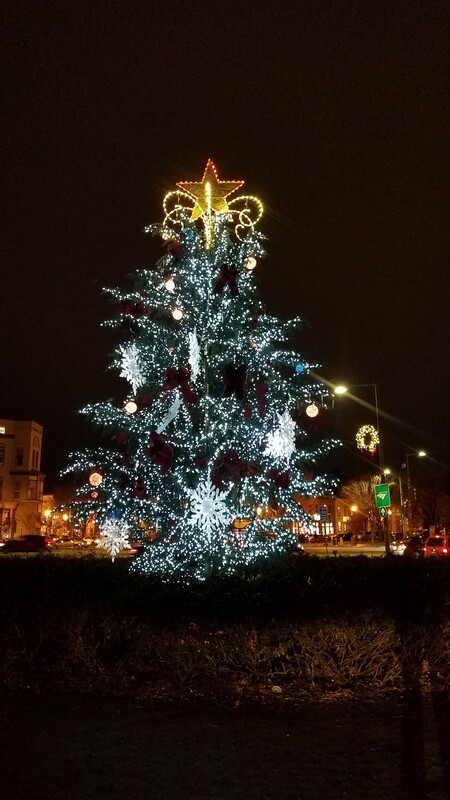 Barracks Row MainStreet engaged Weinstein to create the redesign plan in 2013 and paid for her services with a $500,000 federal earmark obtained for that purpose years before. Co-Chair Madeleine Ondendahl, (Executive Director of Eastern Market Main Street) told CHC that the plan as presented didn’t include key things from the Weinstein/OvS plan which are important to the community, including benefits to the business corridors. She said she would continue to work to modify the plan to be where we want it to be – a Town Center. One of the major changes which disappointed the business community was elimination of the proposed relocation of the bus stops. The city doesn’t want to do it, citing the expense involved with moving utilities. The Advisory Team pushed back on this, securing a commitment to meet with the Department of Transportation on the issue. Another was the Moya plan’s proposal to allocate space on the south side of D Street for food trucks, which would not only compete with brick and mortar restaurants, but hide Hill’s Kitchen, FedEx and other D Street retail from the Metro exit. Weinstein’s proposed entrance to and underground extension of the Southeast Library is gone by necessity since DC Library has deemed it unfeasible. But also gone is the bosque of trees on the main Metro Plaza. In addition, the Moya plan would halve the number of proposed trees in their redesign plan as well as eliminate trees from the median strip. An unwelcome addition in the Moya design was the proposed closure of the short extension of D Street in front of the Hine Project’s day care center. The consensus of stakeholders is that the first phase of the re-design should be the children’s playground and greenspace on the triangle between 8th and 9th Streets and PA Avenue and D Street. The Moya design had re-arranged Weinstein’s components of the design for the park, relocating the playground closer to D Street, to the disadvantage of the residences on the north side of the park. As the result of the concerns, Moya’s 4th version plan will not be presented to the community on Thursday night, rather a new iteration based on input from the Advisory Team will be presented. Some attendees found “a lot of good things” in the Moya plan and left the meeting encouraged that the design team had listened to the concerns and better understood that the community would resist wholesale changes because of wide community support for the Weinstein/OvS plan and because so much time has already been devoted to that plan. It was the feeling of some that the design team wanted the community’s input; DGS, not so much. One attendee felt the room was “universally disappointed” about the way DGS has handled the situation. Some stakeholders were put off by what they called a lack of sensitivity, e.g., the “very cavalier” way the plan was presented and the thinking the plan would “stick to the wall” without knowing much about the community and its involvement. Another participant said s/he felt “disrespected,” citing the Monday morning’s meeting being called on short notice and with little or no consultation. Another cited briefing papers carelessly left by the organizers which, when asked about, prompted a flustered organizer to retrieve them leaving the impression that they didn’t want the Advisory Team to know about them. One participant thought the organizers fell short by not being more inclusive in the Advisory Team’s membership, especially regarding representation from nearby residents and those who will actually use the park. The disgruntlement extended beyond the members of the Advisory Team. 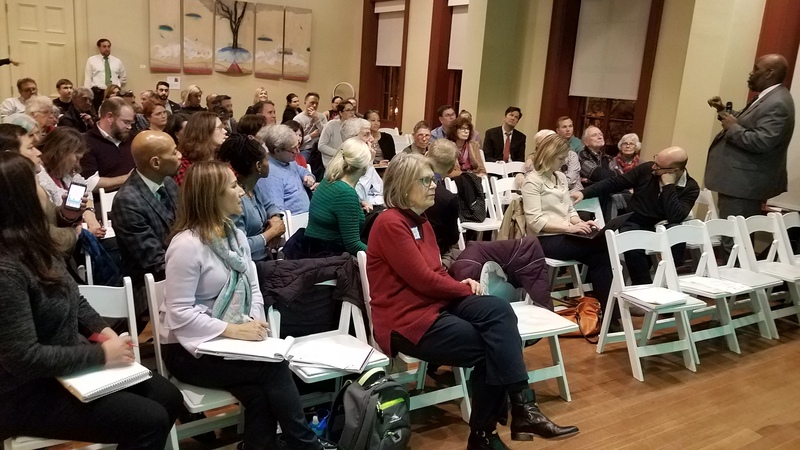 When ANC6B Commissioner Jerry Sroufe – a member of the Advisory Team – reported to the full ANC6B about the meeting on Tuesday night, the commission was miffed that there had not been better communication between DGS and the ANC. Commissioner Kirsten Oldenburg said “It is unbelievable DGS hasn’t bothered to contact us on a project of central importance to the ANC. I had to find out about the community meeting on Thursday night third hand. Another thing we haven’t heard about from anybody is the temporary playground to be built with PUD community benefit funds from the Hine Project that appears to be underway.” That temporary playground – long in the works – will be incorporated into the re-design of the park. Given the apparent short shrift shown the ANC by DGS, the role of the ANC in providing commission-specific input on the project is uncertain, despite the involvement of three city agencies – DOT, Historic Preservation, and the Zoning Commission – which are directly within the ANC’s province. Schematic of the refined master plan for the redevelopment of the Eastern Market Metro Park. ANC6D meets a 7:00pm, 1100 4th Street, SW.
Public Safety Report- First District MPD (PSA 105 & PSA 106) Capt. Pulliam, Lt. Lavenhouse. Races/Runs/Events: Rock & Roll Marathon, DC Bike Ride. 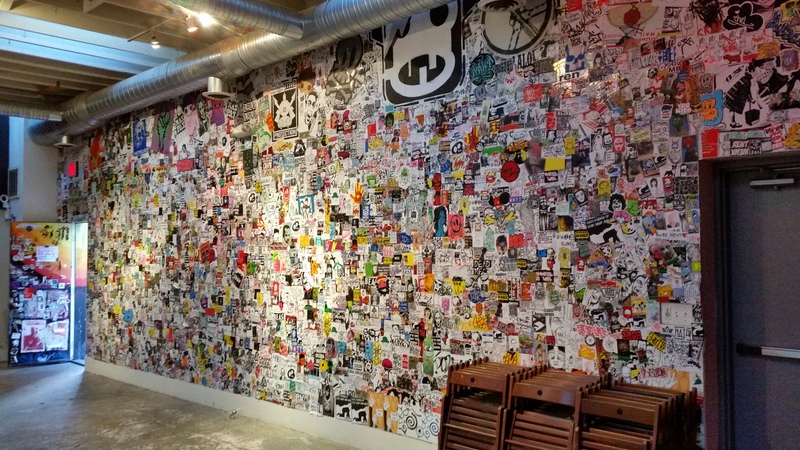 Wise Guy Pizza & Altani Gelato, 202 M Street, SE: new DR Restaurant license and Summer Garden. Wharfside Bar, 801 Wharf Street, SW: new CT Tavern license w/Entertainment & Dancing and Summer Garden. 1215 Carrollsburg Place, 3rd Story & Rear Addition: Zoning Adjustment Application. Proposed letter to DCHA regarding temporary extension of authority to use vacant square in 6D as a parking lot, pending development into DCHA housing project. Zoning Application. Waterfront Station/1000 4th Street SW PUD: Zoning Application. 861 New Jersey Avenue, TOPS and Zoning Adjustment Application. Yards Parcel F1, Zoning Application for PUD Extension. Yards Parcel I Design Review, Zoning Application. Proposed letter regarding Greenleaf Community Center Security Concerns. ANC6C will meet at 7:00pm at the Heritage Foundation, 214 Massachusetts Avenue, NE. Presentation: Christopher Shorter, DPW Director to address trash, recycling, composting issues. Discussion: Maryland Avenue road diet out for bid, construction to begin early 2019. Discussion: Washington Gas Maryland Avenue, NE project. The Dubliner, 4 F Street, NW: Public Space Application for enclosed sidewalk café. Fancy Radish, 600 H Street NE: Public Space Application for enclosed sidewalk café. 910 Sixth Street, NE: Zoning Adjustment Application —Special exceptions to construct a two-story addition. 634 Lexington Place, NE: Historic Preservation Application – concept approval to alter roofline to create third floor and basement entrance. Patterson Street, NE: Four of the six respondents to DMPED’s RFP. ANC6B Hill East Task Force meets at 7:00pm at St. Coletta of Greater Washington, 1900 Independence Avenue, SE. 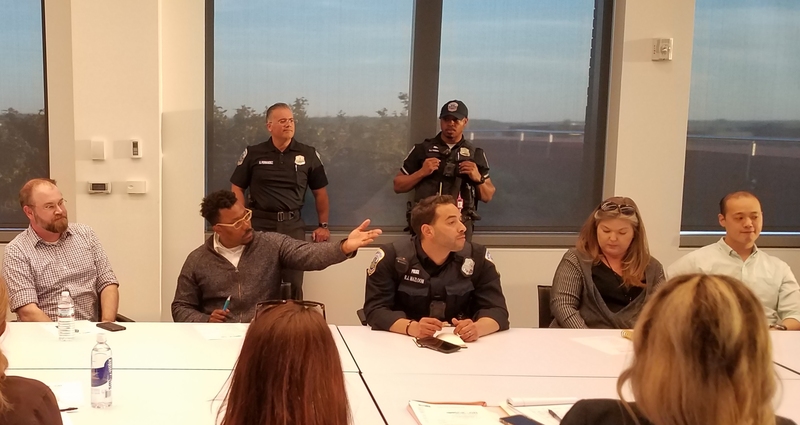 Community meeting to discuss the future of Reservation 13 and RFK, with MDP – LT Ron Wilkins, DDOT – Amanda Stout, DMPED – Ketan Gada, DGS – Jeff Licklider, and developer Chris Donatelli. Office of Victim Services and Justice Grants (OVSIG) will not be participating in the meeting as the agency has not yet selected an awardee for the DC Jail outreach contract. The awardee will be selected by the end of the month and OVSJG has agreed to meet with residents in January to brief them on the contract. ANC 6B will meet at 7:00pm in Hill Center, 921 Pennsylvania Avenue, SE. Cocineros, LLC. t/a Taco City DC; 1102 8th Street, SE: Retailer’s Class “C” Restaurant license; New restaurant with seating capacity of 45, Total Occupancy Load of 45. The license will include an Entertainment Endorsement. District Soul Food Restaurant & Lounge, LLC. t/a District Soul Food Restaurant & Lounge; 500 8th Street SE: New Restaurant serving soul food. Requesting an Entertainment Endorsement to provide live entertainment inside the premises only. Sidewalk Café with 40 seats. Total Occupancy Load is 199 with seating for 180. Emilie’s, LLC. t/a Emilie’s; 1101 Pennsylvania Avenue, SE: New Class “C” Restaurant serving farm-to-table American dim sum and other Asian-inspired food. Total Occupancy Load of 150 with seating for 110 patrons inside. 500 13th Street, SE: Public Space Application for Free Standing Sign. Proposed letter to DCHA regarding extension of authority to use vacant square in 6D as a parking lot, pending development into DCHA housing project. Proposed letter to DC Councilmembers on streamlining the alley homebuilding process. Proposed letter to DDOT on Vision Zero All Way Stops, recommending four-way stops at four ANC6B inersections. Presentations: Invitation to DC DoH regarding homeless facilities. Eastern Market Metro Park Project First Community Meeting, 7:00 – 9:00pm, Hill Center, 921 Pennsylvania Avenue, SE. ANC6A meets at 7:00pm at Miner Elementary School, 601 Fifteenth Street, NE. S-Square, LLC t/a Cheers DC! At 1402 H Street, NE: Vote on approval of a Settlement Agreement with and withdrawal of the license protest. Proposed letter to HSEMA in support of the revised route for the Rock N’ Roll Marathon. Proposed written comments to DDOT and letter to the DC Council regarding the proposed regulations for E-scooters and E-bikes expressing these views: 1) General support for the regulations as they will improve public safety with respect to the use of these motorized vehicles. 2) Particular support for the requirement of governors on E-scooters that will restrict the speed to 10 mph until such time as E-scooter operation can be effectively eliminated from sidewalks and other pedestrian walkways. This may require their re-classification so that they are not considered “personal mobility devices” 3) Additionally, helmets should be required when using any of these motorized vehicles, whether E-scooters or E-bikes – as is already required for motorcycles. 4) Cash payment devices should be designed in such a way that they cannot easily be vandalized. Maury Elementary School: Proposed letter of support to BZA for a request for variance regarding the location and screening of HVAC units on the lower roof over the kitchen of the new school, and the nature of the parking lot fence for Maury Elementary School at 1250 Constitution Avenue, NE. 201 8th Street, NE: Proposed letter of support for Historic Preservation Application for redevelopment of an existing medical office building with a surface parking lot into residential use, and on the surface parking lot, to build four condo units on two separate lots at 201 8th Street NE. Residential Parking Permit restrictions be added to condo bylaws, and consider ways to address parking and congestion concerns. 223 9th Street, NE: Proposed letter of support for Historic Preservation Application for a three-story addition and renovation to a single-family home at 223 9th Street, NE. Proposed letter to DC Public School Charter Board regarding notification period to ANCs for key changes to charter schools. The Capitol Hill Restoration Society Zoning Committee meets at 7:30pm, at Kirby House, 420 10th Street, SE. “Save Our Vote” – organized by the Restaurant Opportunities Center (ROC) – launched their effort to resurrect the tipped worker minimum wage issue and put the question back on the ballot in 2019. To do so, they must collect roughly 25,000 valid signatures from registered DC voters by Thursday, December 13. 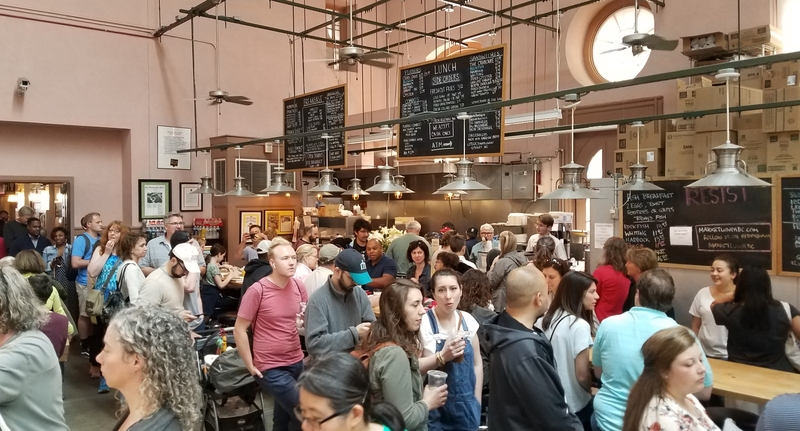 The Restaurant Opportunities Centers United (ROC) is a not-for-profit organization and worker center whose mission is to improve wages and working conditions for the nation’s low wage restaurant workforce. This morning, three signature collectors were working the Eastern Market Metro Plaza area, one on the Plaza, one in front of Trader Joe’s, and one in front of Le Pain Quotidian. Voters approved the original Initiative 77 by a solid majority of 56% last June. Initiative 77 would have eliminated the tipped minimum wage of (currently $3.89 an hour) and create a single minimum wage for everyone rather than depending on tips to make up the difference or payments from the employer if they do not. Under pressure from the restaurant lobby, the DC City Council, guided by chair and At Large member Phil Mendehlson, repealed the results of that vote in October. Ward 6 Councilmember Charles Allen voted against the repeal. This latest signature effort amounts to an attempt to place the question of whether to “repeal the repeal” before DC voters. 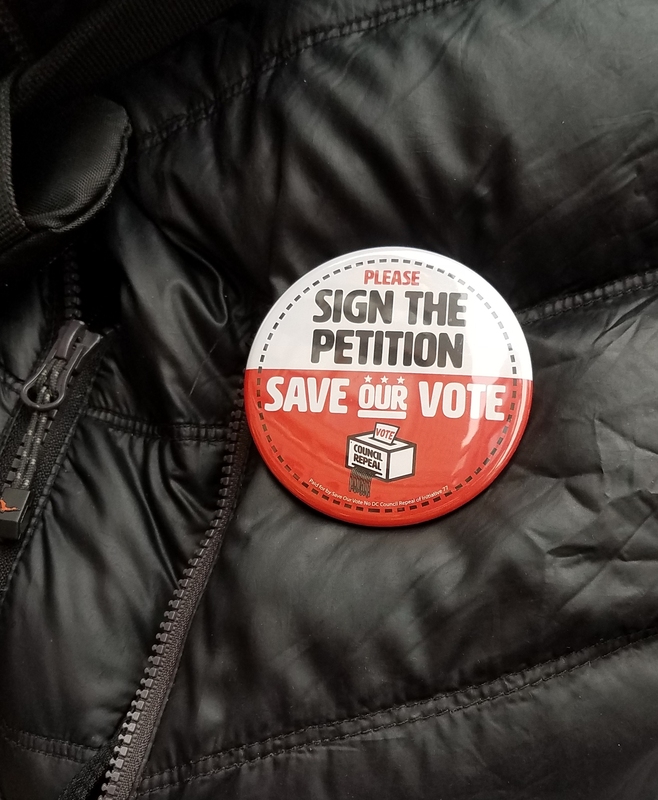 “Save Our Vote” DC hopes to attract support from voters who agreed with the original ballot initiative, as well as those who object to the DC City Council’s repeal. That action by the Council threatens the validity of an initiative process. In recent years, initiatives have been used to alter drug policy, the process by which DC’s Attorney General is selected, and reinforce DC’s desire for budget autonomy. Initially “Save Our Vote” hoped to secure petitions from the DC Board of Elections and begin collecting signatures last week, but a challenge from the restaurant industry (represented by frequent restaurant industry mouthpiece attorney Andrew Kline) delayed that action by over a week. In an emergency meeting held Tuesday night, the DC Board of Elections ordered the petitions after a preliminary hearing by the DC District Court cleared the way for the petitioning process to begin. A second hearing on the lawsuit next week could affect the validity of the effort when has been allowed to proceed on a provisional basis. Kerry L. Smyser, Senior Deputy Director, DC Housing Authority, briefs ANC6B Planning and Zoning Committee Tuesday night. Tuesday night, Kerry L Smyser, Senior Deputy Director of the DC Housing Authority (DCHA), told ANC6B’s Planning and Zoning Committee that rebuilding the Arthur Capper Senior Center at 900 5th Street, SE, will take 2.5 years. A demolition contractor has been selected, and demolition will begin in “the next week or so,” according to Smyser. The building had a wooden frame; consequently no part of the structure except the concrete can be salvaged. The intent is to rebuild the exact building. The building was destroyed by fire on September 19 leaving 160 residents homeless. Some personal possessions of residents were saved, but much was lost to fire and water damage. DCHA has issued vouchers for temporary housing for the former residents in the interim. The vouchers gives the residents the option to live in the community of their choice in a rental unit in any privately owned property in the city, as long as it meets Fair Market Rent standards established by the U.S. Department of Housing and Urban Development (HUD). Tenants pay 30 percent of their household income for housing – DCHA pays the rest directly to the landlord. Smyser said A Wider Circle – a (501(3) charitable nonprofit organization http://awidercircle.org/ – has engaged with residents to provide furniture, and churches have stepped up to adopt some seniors and provide clothing. 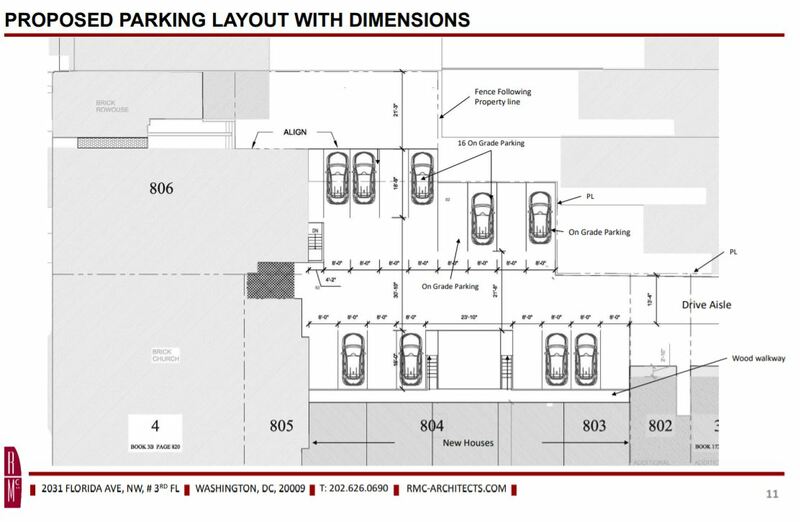 The conversation about Capper evolved out of an appearance by Smyser before ANC6B to enlist its support for a five year extension of a vacant square in ANC6D for use as a parking lot, pending on-going planning for its eventual development into market rate, public, and affordable housing. The agency has been using the lot for parking for the baseball stadium and for commercial parking for the past ten years, using the revenue for pre-planning for new housing on the site. ANC6B commissioner and Planning and Zoning Committee chair Nick Burger, pressed Smyser on why DCHA couldn’t move faster to develop affordable housing in the face of the housing “I don’t want to say crisis, but…” The lot has been used for parking for ten years while plans are developed for the housing project. Smyser explained the complicated relationship between the DCHA – an independent agency of the city government – and the Federal Department of Housing and Urban Development, difficulty in getting financing, the scarcity of pre-development funds, tenuous support from other DC agencies, the ongoing redoing of 13 of DCHA’s 56 public housing properties, and the desire of DCRA to maintain control over any housing developments rather than sell land to a developer – all of which work to slow progress on development of vacant land owned by DCRA. The committee voted 10 – 0 to support continuation of the use of the lot for parking for another five years with the hope that this would be the last request for an extension. The letter will go to the full ANC6B for final action at its December meeting next Tuesday. The District of Columbia Housing Authority is an independent government agency whose purpose is to provide affordable housing to extremely low-to moderate-income households. It is one of DC’s largest landlords, providing some 50,000 low-income residents with affordable housing, tenant- and project-based housing vouchers, and mixed-income properties. Hilton Garden Inn, 1225 1st St., NE – application for a retailer’s Class “C” Hotel and 25% Class B liquor licenses. Capitol Hill Restoration Society Historic Preservation Committee meets at 6:30pm at Kirby House, 420 10th Street, SE. ANC6B Planning and Zoning Committee will meet at 7:00pm, at St. Coletta of Greater Washington, 1901 Independence Avenue, SE. 2019 Rock N’ Roll DC Marathon and Half Marathon scheduled for Saturday, March 9, 2019. 500 13th Street, SE – Public Space application for a free standing sign, single head or double head meter, and bay window projections. ANC6B Transportation Committee will meet at 7:00pm in Frager’s Conference Room, 3rd Floor, the Hill Center, 921 Pennsylvania Avenue, SE. Discussion on Mayor Bowser’s and CM Allen’s Vision Zero Enhancement Amendment Act of 2018. Compilation of 6B List of Bike Rack Needs. ANC6C Planning, Zoning, and Economic Development Committee meets at 6:30pm, Northeast Library, 7th and D Streets, NE. 910 6th Street, NE, – application for zoning adjustment from rear addition requirements, the lot occupancy requirements to construct a two-story rear addition to an existing semidetached principal dwelling unit. 634 Lexington Place, NE – Historic Preservation application for concept approval to alter roofline to create third floor and create basement entrance. 2 Patterson Street, NE – Presentation: Four of the six respondents to DMPED’s RFP (request for proposals) for development of 42,000sf lot will make presentations and answer questions. Jefferson Apartment Group/Argos Group/SGC Development. Republic Properties Corporation/Urban Matters Development/Capstone Development Partners. The two other respondents will present at the January committee meeting. ANC6B Alcoholic Beverage Control Committee will meet at 7:00pm at the Hill Center, 921, Pennsylvania Avenue, SE. Cocineros, LLC. t/a Taco City DC; 1102 8th Street SE; Retailer’s Class “C” Restaurant license; New restaurant with seating capacity of 45, Total Occupancy Load of 45. The license will include an Entertainment Endorsement. Hours of Operation and Live Entertainment: Sunday 7am-12am, Monday-Thursday 7am-2am, Friday and Saturday 7am-3am. Hours of Alcoholic Beverage Sales: Sunday 10am-12am, Monday through Thursday 10am-2am, Friday and Saturday 10am-3am. Emilie’s, LLC. t/a Emilie’s; 1101 Pennsylvania Ave SE; New Class “C” Restaurant serving farm-to-table American dim sum and other Asian-inspired food. Total Occupancy Load of 150 with seating for 110 patrons inside. Summer Garden with 35 seats. Hours of Operation and Alcoholic Beverage Sales: Sunday through Thursday 8am-2am, Friday and Saturday 8am-3am. ANC6C Transportation and Public Space Committee meets at 7:00pm, at Kaiser Permanente Capitol Hill Medical Center, 700 2nd Street, NE, Room G3-G4. Discussion of Maryland Avenue road work which is out for bid, construction expected to begin in early 2019. Washington Gas Maryland Avenue NE Project – update for the community on Washington Gas project for Maryland Avenue. The Dubliner Enclosed Sidewalk Café – application for a new enclosed sidewalk cafe for The Dubliner.